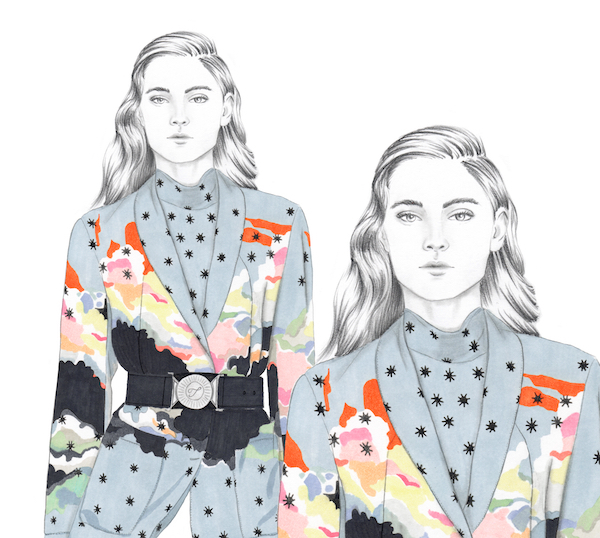 With a background in fashion styling Fiona Luciani followed her heart and became a fashion illustrator. She finds her inspiration in fashion and French poetry. "Illustration helps me everyday to become a woman and each emotion that I feel has a real impact on my work". 1. Hi Fiona great to have you here! Tell us something about yourself. 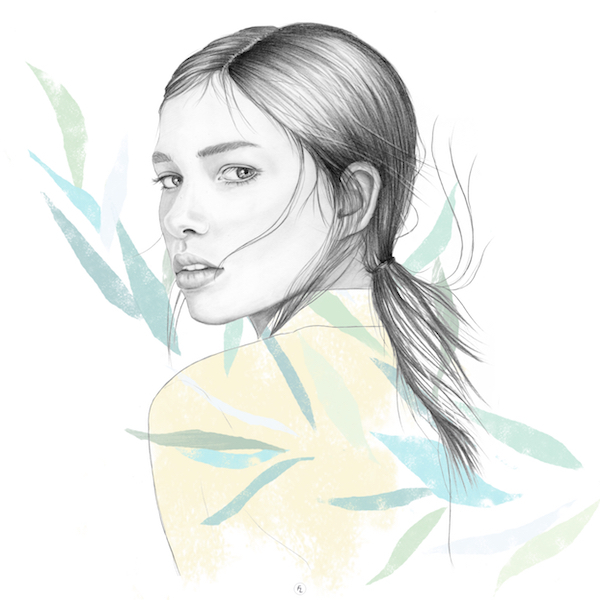 I am a Fashion & Beauty Illustrator based in Paris. I work at my place wich I love to call home. Originally from Corsica, I go back every summer to take a shot of the local fauna’s smell called macchi. It's been 28 years now and I’ve never got tired of watching the mountain flow into the sea. I like Corisa’s wildness nature and that every sunset has a different color. It might seem cliché but as far as i can remember I’ve always been drawing. Growing up I was more interested in fashion itself. That’s why I naturally decided to learn stylism in a Parisian fashion school. I’ve created 3 collections and I learned a lot about clothes and women who wear them. After graduating I’ve worked in different creative studios. From Haute Couture to Ready-to-Wear and even jewelry, my eye became sharper. Last year i went back to illustration with fashion silhouettes from runways. I felt so fulfilled that I decided to make it my full time job! As a stylist, I consider fashion as a means of expression. The way to mix shapes, colors and patterns reflects your identity. That's how I would describe my style: i try to translate each woman's personality through her clothes or her face's expression. First ? Coffee ! Then, I always start drawing with graphite pencil. I like to use markers for my fashion illustrations, they emphasize my love of colors and textiles. For portraits I prefer watercolor touch and add some botanical illustration to always stay poetic. As a designer, rendering fabric and textures is very important to me, i have plenty of tips. Coloring using the wooden veines of my desk is one of them. The sensitivity of working by hand is incomparable. Then I use photoshop because scan weakens the vibrant colors and sometimes I also use it to make collages with other elements that I drew. I put my signature and VOILA ! I look at life with a curious eye that constantly searches for inspiration in everything I see. Fashion is my favorite subject of all, it’s constantly renewed. French poetry is an endless source of inspiration too, « Les fleurs » of Stephane Mallarmé, Jean Cocteau and his entire work. A feminine icon Simone de Beauvoir and her statement “One is not born, but rather becomes, a woman”. Illustration helps me everyday to become a woman and each emotion that I feel has a real impact on my work. Working with fashion and lifestyle magazines, amazing brands like Zimmermann, Leonard Paris, Nina Ricci, Temperley for London, Delpozo. I think illustration can be used almost anywhere and that's what makes it so interesting. Beauty and cosmetics would be a great adventure too! I also like personal commissions like portraits, collages, patterns, it’s all about understanding the customer’s wish. I thought it was obvious ! Everything in a woman is beautiful, her eyes, hairstyles, freckles, attitude with clothes, … We are at the dawn of a significant change in women's history. Speech is free and clichés established for a long time are no longer actuality. I think someway i am a little bit feminist but isn’t it THE modern way to be feminine ? Good question … I would say a good sens of humour, my childish side and my little herbarium thats follows me everywhere. First, 2017 was an incredible year: I worked hard on my technique and i found my balance. I’d like 2018 to be as strong in terms of challenges and surprises. My dream is to have a column in a fashion magazine. I would illustrate the women I love and some of my favorite runway looks while trying to decipher the modern way of being a strong and confident woman.